Being the fifth week of the month we have our "Lucky Dip"
It is a wonderful source of colour combinations. our wonderful LIMette Jenny is our guest. Lots of you follow Jenny and you obviously love her work as you leave her lots of FAB comments She is a constant source of inspiration to all of us. Here she has made this fabulous card ... a reminder of our youth, with a daisy chain. This card is based on a sketch I used last week and utilised a Blockhead stamp which I coloured with markers, two shades of pink for the head and green for the stem. It's mounted on Nesties and is sitting on a band decorated with Pink Petticoat harlequin DP. I made the banner with a Spellbinder's pennant die. Stamp the sentiment and arrange the die with a long tag on the side nearest the die cutting machine. Roll the die part way through the machine stopping before it has gone through completely, then wind back. Remove the die and place it around the other end of the sentiment, once more putting the V shaped end through the machine first and only rolling part way along the die so as not to cut through the middle of the sentiment panel. This is back to my favourite inking technique. The bottom of the card was masked with post its and the inks, Pear Pizzaz and Basic Grey, were added with Ink Duster Brushes. 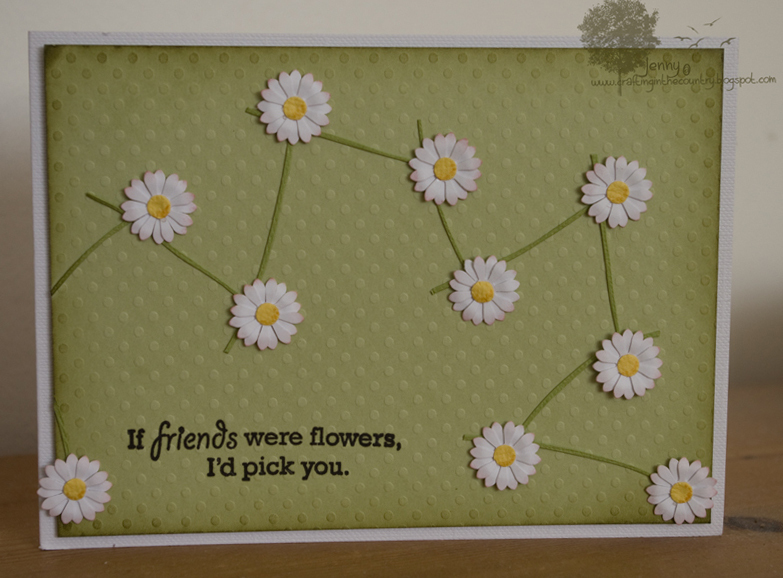 I stamped some text in the green shade and then added the blooms (Unity stamps) with the addition of a dash of pink! The sentiment is from Paper Make Up. I almost gave up when I added the grey colour as it seemed to look dreadful, but I continued and the addition of the images transformed the whole look of the card... so don't abandon hope too soon if you try this technique, if you persevere, things often turn out better than you might think! My first card came together instantly! I stamped the Butterflies sentiment from a fabulous set my lovely Chrissie bought me last year for my birthday. Ashamed to say this is the first time I'd inked it! It is Katzelkraft Isabelle Norris English Quotes KT250. I stamped using Stazon Stone Grey, then stamped with Versamark, the harlequin from a Tim Holtz set French Market. I heat embossed with WOW Neutral Ultra Shimmer Glitter embossing powder. So hard to photograph, but it is so lovely and glittery. I then took a Stampin' Up Pretty in Pink ink pad and using a dauber I sponged the ink in the right hand corner, out to the bottom edge and right hand side. Along the left hand edge, I drew a glue line with my Zig glue marker and sprinked with Glamour Dust. To finish I added the Martha Stewart punched butterflies. Colours are Stampin Up card Pretty in Pink, Pink Pirouette and Certainly Celery, lastly I added a few pearls. For my second card I stamped the green spotted strip with Stampin Up Borderlines in Certain Celery. Then I Stamped the square Solid Stripes, also Stampin' Up and heat embossed as above. Can see these ending up in the bin! The Hero Arts flowers are from a set, the flower heads are in squares, therea re 4 designs. ~Again stamped in Stazon Stone Grey, watercoloured with pencils. The sentiment is a retuired SU one. You make such beautiful cards,am putting my thinking cap on now. By the way I have been trying to send an email re stampers club but it keeps being returned! What wonderful creations you've made to inspire us yet again - so glad to be back (again!!) Well done also to Jenny your GD - fabby card! Wonderfully pretty spring colours and cards love your 2 too Mandi don't throw them away! Great tutorial and cards Chrissie and Jenny's card is as you say a lovely memory of daisy chains. Thanks for a fun challenge and the lovely inspiration from the DT. Wonderful DT inspiration! I love these colors and they're so easy to work with. Great challenge, thanks! 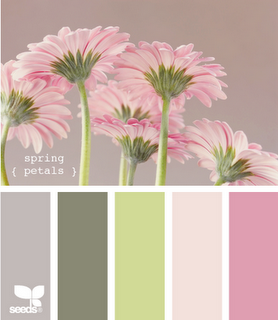 The inspiration picture and your beautiful cards and so perfectly colored for spring! Between your cards and the entry cards, I'm drooling! Thanks so much for the link to Design Seeds, one of the most beautiful and inspirational sites I have seen in a long time. Great challenge! Those colours are so beautiful. I love this inspiration. Thanks for the fab inspiration--gonna try to make another card! YOURS are amazing! :) Fab job, ladies!!! LINKZ doesn't work somehow :-( Will try later to submit my card. Gorgeous inspiration from both of you.